Looking for more informationabout the work of other ally-focused organizations and projects? If you'd like to learn more about the ever-expanding work that is being done both locally and nationally, the links below will provide you with a few places to start. We acknowledge that this is by no means a comprehensive list of resources and that links may become out of date without our knowledge. 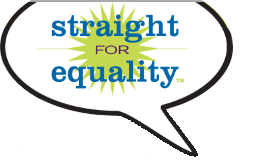 If you notice a link that no longer works or have suggestions for something that we should consider please contact info@straightforequality.org! Athlete Ally is an organization founded by Straight for Equality in Sports award winner Hudson Taylor to encourage athletes of all ages to treat their teammates with respect and dignity and to combat harassment and bullying based on real or perceived sexual orientation and gender identity on the field and in the locker room. Ally Week is a project of GLSEN organized to help student groups recognize and celebrate straight allies dedicated to stopping bullying and harassment in their schools. GLSEN has a number of organizing resources available so that students can organize activities and programs. This is a great list from the GSA Network that documents some of the ways that homophobia affects straight people and some simple things that allies can do in their schools to help prevent bullying and harassment. You can also download a PDF version of this list to use as a chapter resource. Get the report card for corporate America on LGBTQ-inclusive policies. Released annually by the Human Rights Campaign use this report to learn more about where your company stands when it comes to equality. The results may surprise you. You can also use it to inform your purchases and they even have a smartphone ap to help you make choices on the go. The HEI surveyed many hospitals looking for five main policy criteria: patient non-discrimination, visitation, decision making, cultural competency training and employment policies and benefits. This is a great place to find out what policies are in place at your hospital. This press release details a poll conducted by Witeck-Combs Communications and Harris Interactive that highlights brand preferences and customer loyalty among LGBT customers. It can help you to make the case as to why these issues are important and how inclusive policies can help your company’s bottom line. Equality is good for business. Straight But Not Narrow was founded by Avan Jogia, Andre Pochon, and Heather Wilk in order to engage young, straight, men in the campaign to end bullying and harassment. Through social media, merchandising, and collaborative campaigns with other equality organizations they are trying to positively impact the way that America’s youth feel about LGBTQ equality. Written by The Human Rights Campaign and PFLAG National this guide was the first of its kind publication meant to engage allies. This guide outlines the right, and wrong, things to do when a person comes out to them, dispels some common myths about LGBTQ people held by the general public, and outlines some simply ways to show support. The Center for Lesbian and Gay Studies in Religion and Ministry (CLGS) provides programming and support for research to serve faith communities, the LGBTQ community and their allies, as well as religious scholars. They have recently developed the Racial/Ethnic Roundtable Project which is dedicated to working within African American, Asian and Pacific Islander, and Latino communities. The Institute for Welcoming Resources is a project of the National LGBTQ Task Force that creates resources, holds events and conferences, and helps to strengthen the welcoming church movement. The organization also offers trainings for faith based groups that would like to become more inclusive and developed ‘The Shower of Stoles’ collection to represent the lives of LGBTQ faith leaders from 32 faith traditions in six countries. Inspired by the untimely death of Brendan Burke, You Can Play was founded by Patrick Burke, Brian Kitts, and Glenn Witman to encourage equality and fairness in sports. They have created a series of videos with college and professional sports teams that ensure that LGBTQ athletes feel welcome in the locker room and respected by their teammates. You Can Play has seen an outpouring of support from the NHL.